Art transcends borders -- until it doesn't. This exhibition is dedicated to the countless artworks that have been lost, damaged or destroyed by customs agents who control the flow of goods between nations in the Middle East. "Art in Custody" addresses how artworks become subject to these overzealous vetting systems -- and when this one-sided prerogative is either misunderstood or abused, as proven by traces of deliberate force or through passive negligence. In 2016, exhibits from the "Cairo NOW! A City Incomplete" show in Dubai were shipped back to Cairo after the project ended. 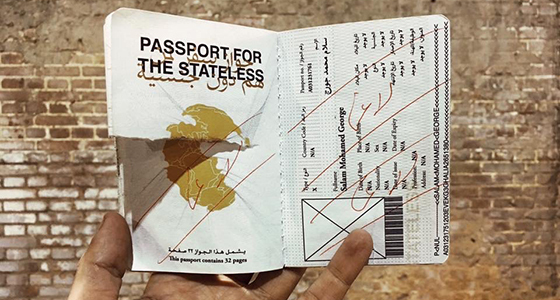 But before they were allowed back in the country, Egyptian state security ripped apart and dug deep lines of red ballpoint pen across every of the 32 pages of Ahmad Hammoud's, "Passport for the Stateless," a work that resembles a passport, but one that is also obviously not a real travel document. When he discovered Hammoud's destroyed artwork, curator Mohamed Elshahad succinctly said that this violation was, "probably the best illustration for what the project is about." The exhibition "Art in Custody" features original artworks and documentation of works that have been defaced by thick permanent markers, serial numbers and signatures sprawled across the actual works themselves, ones that have suffered tears, slits, punctures, or have been irretrievably lost altogether: In addition to Hammoud's "Passport for the Stateless," there is also correspondence around Tarek Zaki's large-scale installation "Monument X," that was shipped to an art fair the Arabian Gulf but simply disappeared without a trace, as well as Dutch photographer Bas Princen's large-scale landscape photography that was scheduled to be exhibited a full year and a half before it was finally released from customs, not without almost causing a diplomatic escalation. "Art in Custody" is a quantitative exhibition that provides a safe space for dozens of object-based artworks (or documentation thereof) that have been caught up in a regional climate of political paranoia, where the aggressor is paradoxically both known, yet who also remains entirely anonymous. In addition to some of these better-known cases, defaced, destroyed, or lost artworks from the Middle East will be made accessible to the public in apexart's exhibition space in New York, perhaps for the first time ever -- and as long as they make it through customs. Alexandra Stock is a Swiss/American curator and artist based mainly in Cairo since 2007. She holds a BFA from the Zurich University of the Arts, participated in De Appel's Curatorial Program, and has held curatorial and/or managerial positions at three leading contemporary art institutions in the MENA region. She has co-/curated exhibitions and festivals in Alexandria, Amsterdam, Bahrain, and Cairo and has exhibited or screened her own work in Amsterdam, Belgrade, Brussels, Cairo, Dahab, Kampala, Lomé, Maastricht, Paris, Winterthur, and Zurich. Stock is currently developing a project with support of the FfAI and is pursuing a MA in Diplomacy at SOAS.